At the start of the twentieth century, aircraft engines were simple, low-powered machines that were designed and built one by one for specific aircraft. But very soon, engines started being built in quantity, often by several manufacturers in different countries who were licensed by the designer or initial manufacturer. In the United States, particularly during World War I, automobile manufacturers dominated the aero-engine field until companies that specialized in aircraft engines were established in the 1920s. A cutaway drawing of the 1903 Wright Flyer engine. The earliest aero engines were stationary—either radial in style or in line. The Antoinette series was the most commonly used. These were succeeded by the popular rotary engine. 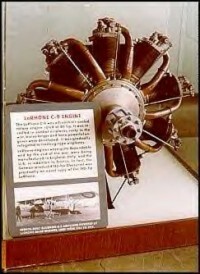 The best known were the Gnome and Le Rhône, which were used on the majority of aircraft until the in-line Liberty engine, designed for mass production, started dominating the aero-engine market. From that point on, increasingly more sophisticated and powerful stationary in-line engines were developed until the arrival of the jet engine a couple of decades later. The most advanced aircraft engine early in the century was the 50-horsepower (37-kilowatt) engine designed by Charles Manley for use on Samuel Langley’s aerodromes. But because Langley’s aircraft never succeeded in flying, these engines did not have the opportunity to demonstrate their potential. The engine designed and built by Charlie Taylor and the Wright brothers for their Flyer, although much lower powered, had a greater place in history because it propelled the first successful powered flight in 1903. 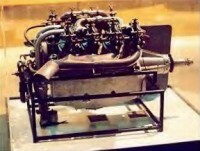 Wright’s engine had four inline cylinders, was water-cooled, generated 12 horsepower (9 kilowatts) (as compared to Manley’s 50 horsepower), and had weighed about 179 pounds (81 kilograms) without the fuel. It had no fuel pump, carburettor, or spark plugs. This Curtiss four-cylinder water-cooled engine was America’s first military aircraft engine. It was used to power the 1908 Signal Corps Dirigible No. 1. 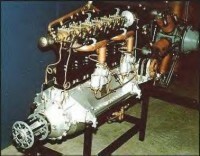 The Curtiss Aeroplane and Motor Corporation produced two notable engines. A four-cylinder water-cooled engine used in the 1908 Signal Corps Dirigible No. 1 was America’s first military aircraft engine. It could generate about 25 horsepower (19 kilowatts) and drove a 22-foot (6.7-metre)-long tubular steel shaft that turned a wooden propeller. Lieutenant Thomas Selfridge designed it. In its speed trial, it reached 19.6 miles per hour (31.5 kilometres per hour). Curtiss also produced thousands of OX-5 water-cooled engines during World War I, primarily for the Curtiss “Jenny.” It generated only 90 horsepower (67 kilowatts) but, compared to other engines of the period, was very reliable. Thousands of Curtiss OX-5 water-cooled engines were produced in the United States during World War I, primarily for the Curtiss Jenny airplane. The Antoinette engine was designed and built in France by Léon Levavasseur. Named after the designer’s daughter, it was Europe’s most widely used engine until 1909-1910. The first Antoinette engine dated from about 1901 and was used in a speedboat. By 1905, Levavasseur had produced a water-cooled engine with eight-cylinders arranged in a 90-degree “V” and with direct fuel injection. It was safe, strong, and fairly powerful, generating 50 horsepower (37 kilowatts) and weighing about 110 pounds (50 kilograms). Its power-to-weight ratio was not surpassed for 25 years. 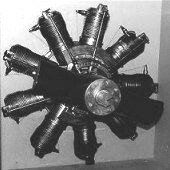 The French and British-built Anzani 10 was an air-cooled radial engine that was installed in French Caudron aircraft. An Anzani engine carried Louis Blériot’s monoplane across the English Channel in 1909. It was a three-cylinder, air-cooled, semi-radial engine that developed 25 horsepower (19 kilowatts). It was relatively low-powered for such a long flight. The engine had automatic inlet valves and mechanically operated exhaust valves, with auxiliary exhaust ports in the cylinders. Later Anzani engines generated 90-100 horsepower (67-75 kilowatts) and were used in French-produced Caudron aircraft in 1915. The Gnome 9-N engine was the first successful air-cooled rotary engine used extensively in airplanes during the 1909-1910 period. Numerous types of Gnome engines were designed and built, one of the most famous being the 165-hp 9-N “Monosoupape” (one valve) that was used during World War I primarily in the Nieuport 28. 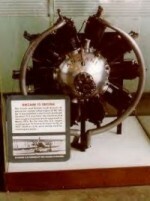 The Gnome 50-horsepower (37-kilowatt) rotary engine revolutionized aviation. Although F.O. Farwell developed the first successful air-cooled rotary engine in the United States in 1896, it was the French-built Gnome rotary that was first used extensively in airplanes during the first years of World War I. Designed by the Séguin brothers and first marketed in 1908, it was the first of a long line of ever more powerful wartime engines. 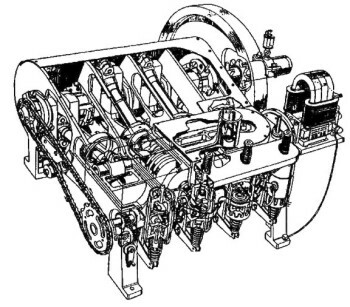 A typical rotary engine, it had a fixed crankshaft and rotating cylinders and crankcase that carried the propeller with them. Numerous types of Gnome engines were subsequently designed and built. One of the most famous was the 165-horsepower (123-kilowatt) 9-N “Monosoupape” (one valve). The engine had one valve per cylinder. Having no intake valves, its fuel mixture entered the cylinders through circular holes or “ports” cut in the cylinder walls. It was used during World War I primarily in the Nieuport 28, which the U.S. Air Service purchased from France, and also by the thousands in other Allied aircraft. This engine, produced under the names of Bentley Rotary B.R.1 in Britain, the Thulin in Sweden, and the Oberursel UR.I in Germany, dominated the industry until 1916. 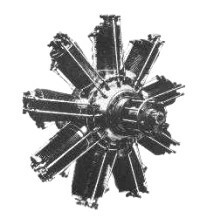 The Clerget rotary engine was used in many Allied fighter planes during World War I. One powered the famous Sopwith Camel. Around 1911, other engine manufacturers began building rotary engines. LeRhône and Clerget engines, both built in France, were used in many Allied fighter planes. The LeRhone C-9 was a French air-cooled rotary engine. It was used in combat airplanes early in World War I, but as larger and more powerful engines became available, it was relegated to use in training-type airplanes. LeRhône engines were quite reliable and, by the end of the war, were being manufactured in Britain, Italy, and the United States in addition to France. The Germans also produced the 110-horsepower (82-kilowatt) Oberursel, which was practically an exact copy of the 110-horsepower LeRhône. The Clerget powered Britain’s Sopwith Camel. The Rolls-Royce Hawk was used in World War I British airships sent against German U-boats. The British Rolls-Royce Eagle and its successor, the Falcon, marked the beginning of a famous line of aviation engines that produced the Merlins and Griffons of World War II. This liquid-cooled V-12 was developed in 1915. It was built in several versions that culminated with the 375-horsepower Mark VII of 1917. It powered the Vimy plane that John Alcock and Arthur Whitten Brown flew across the Atlantic in June 1919. Mercedes engines powered some of the best-known German fighter planes in the last two years of the war—the Albatros D.V., Fokker D VII, and Pfalz D XII. Nearly all German-designed engines were durable and dependable, with six water-cooled cylinders in line. The Hispano-Suiza 8BE is a V-type liquid-cooled engine. This type of engine was especially compact for the amount of power it produced and was used in numerous types of aircraft. A Swiss engineer of a Spanish car company, Marc Birkigt, designed a number of Hispano-Suiza products. These included a large number of water-cooled V-8 and V-12 engines that were made in France, Britain, and the United States during the war. They were especially compact for the amount of power they produced. In 1916 and 1917, Curtiss produced R-3 and R-4 airplanes that were powered by the Curtiss V2-3 engine. Because this engine was heavy for the amount of horsepower it produced, it was replaced during World War I by the Liberty engine. By far, the most important of all Allied engines, and America’s most significant contribution to the war effort, was the Liberty. In May of 1917, Jesse G. Vincent of the Packard Motor Car Company, and E.J. Hall, of the Hall-Scott Motor Car Company, took over a hotel room in Washington, D.C., for nearly a week and designed the eight- and twelve-cylinder Liberty engines with mass-production in mind. 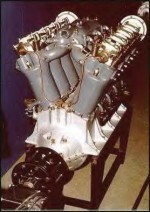 The Liberty V eight-cylinder engine preceded the Liberty-12. It was the first Liberty engine tested in an aircraft, on August 29, 1917. On June 4, 1917, the Aircraft Production Board authorized final design, and manufacture. Assembly of the first eight-cylinder version was completed in the remarkably short span of less than six weeks. The eight-cylinder version debuted on August 29, 1917. It generated 270 horsepower (201 kilowatts) initially but its output was later boosted to 330 horsepower (246 kilowatts). The initial version vibrated excessively and since another engine with this capacity had already been perfected, its development was halted after only 15 had been built. America’s greatest technological contribution during World War I was the Liberty 12-cylinder water-cooled engine. The Liberty 400-horsepower (298-kilowatt) V-12, air-cooled engine, on the other hand, was one of the war’s most powerful engines and one of the workhorses of the war. Designed to be mass-produced with interchangeable parts, the Liberty became the standard wartime aircraft engine, produced by Packard, Lincoln, Ford, General Motors (Cadillac and Buick), Nordyke, and Marmon. It was used most often on the DH-4, the only U.S.-made airplane to go into combat on the Western Front. More than 13,000 engines came off the assembly line before the Armistice, and more than 20,000 were built by the time wartime production ended early in 1919. Following the war, the Air Corps used the engine for more than a decade in numerous types of airplanes. Some were sold to civilians as war surplus and were illegally used in speedboats for “rum running” during the Prohibition era of the 1920s. Others proved their longevity by staying in use much longer, even being used in Russian and British tanks during World War II. Posted on October 31, 2014, in Aviation. Bookmark the permalink. Leave a comment.